this backpack trip with friend and co-servants Nadz and Melissa is my most memorable pre-birthday trip ever. we shared stories of funny experience over the tiring walks that we made from one landmark to another, one food stall to another, and hours of checking out items that we can bring home out of a tight budget. randomly picked, the five who will receive a simple token from Vietnam are as follows: Sonia, Redlan, Luis, Syel, and Dodong Flores. send me an email at i.dongho@gmail.com. note: for those who haven't got their prize yet from previous contests, just re-send me an email your prize are still with me. wow..with your signature bonnet! ^^ layo na ng naabot mo sir dong!! I'll bet it was a great time! Fun photo. wow... Congratulations to all the winners... can't wait for more pictures to be posted!!! But where's my postcard! Haha, congrats to the winners! It was surely a great trip! Nice picture! looking forward for more vietnam adventures. hmm, hindi ako nanalo, dom? i want a recount! 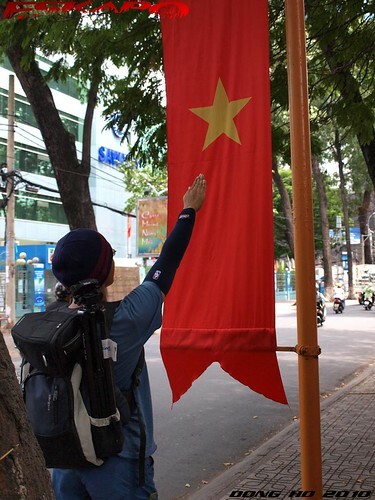 hahaha, oops, kala ko election.. nice hail to viet nam banner! Nice shot! Congrats to the winners.